This is a story from several years ago, but so amusing I have kept it! Back in 2011, on 27th July, a local newspaper carried the following article. It was obvious they didn't believe a word! A place close to Rennes-le-Chateau which will have to be secured in the coming days by the forces of Order. Three reseachers could have discovered the site where was buried the treasure of the Visigoths. This last Sunday the passionate lovers of esoteric secrets, historians and the curious of all coats have discovered on the Internet a manifesto signed by Michel Vallet indicating by a true game of treasure trails, the entry to a passage to access the famous treasure of cthe Visigoths. A revelation born of controversy. Two of the protagonists of the discovery accused the third of wishing to publish alone a book of his account of the affair. By then official questions were being asked. The third retaliated, he revealed the place. 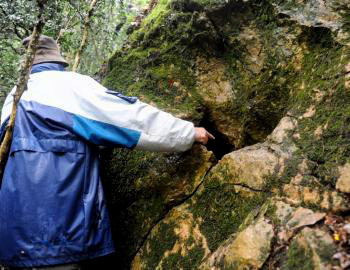 On the web was delivered the locality of the fantastic find by these three new Indiana Jones. The place mentioned, according to the authors of the discovery, Franck Daffos, Didier Héricart de Thury and Michel Vallet, could be indicated in the many paintings of Poussin and essentially in the Stations of the Cross, where Simon helped Jesus to carry the cross carried to the cavity in question. The treasure will from now on be in the process of being discovered. To have made the journey, we must precise to the reader that although we have not found the treasure, the road is not a walkover, without being a station of the cross. It is not in the scope of all and is sometimes dangerous. The cavity or the narrow gallery in question, today blocked, to arrive 8 metres lower in a labyrinth, which finds in the corridor niches, where will repose the famous chest placed in a jewel-case of natural rock, very certainly unveiled since 1294 according to the discoverers. Evidently the owner of the place is worried and is afraid to see arriving a horde without pity. It is an affair taken very seriously by the security services, and the researchers and historians, who mainly do not wish to express themselves publically, but recognise that this place could well be real. A new Grail in the entrails of the earth and several steps from Rennes-le-Chateau which could deliver soon its secrets: if the State authorises the excavations. The expression "Visigothic Treasure" can include much more than the spoils of War, which is what the Jerusalem Treasure was, since Alaric took it from Rome in 410AD. The royal treasury, especially revenue from taxes was also part of the Visigothic wealth. 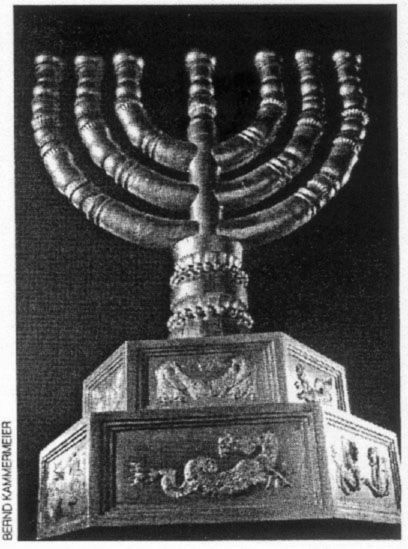 The Ark of the Convenant, once in the Temple at Jerusalem, was never taken by the Romans, the Visigoths or anyone else, for it disappeared around 500AD when the Jews were at war with the Babylonians. But the beautiful table, from which the priests served bread to the poor in the Temple, WAS part of this treasure. It has long been believed that the treasure of the Visigoths was "hidden in the region of Rennes-le-Chateau" but where? Some people thought under the chateau of Blanchefort, now in ruins; my own particular theory was, as Rennes-le-Chateau, known then as Rhedae, was the Visigoths' capital at the time, naturally, their treasure was kept in the crypt of the castle. It and its owners were well-guarded by a garrison of soldiers. Underground tunnels left the crypt so that, in the case of attack, the soldiers could escape out of the back door, so to speak, and circle round to attack the enemy from behind. The Treasure of the Visigoths was in two parts. Firstly, the Royal Treasury, mostly coins paid in taxes or freshly minted - the Visigoths in Septimanie had five mints making their own coins. Secondly, the spoils of war - booty. 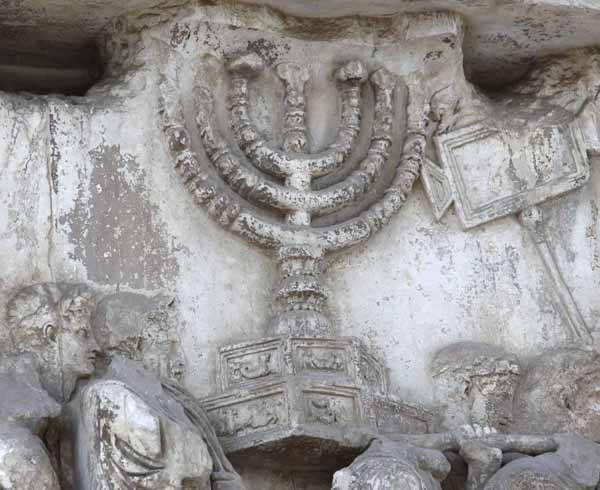 This included the Jerusalem Treasure that Titus took from the Temple of Jerusalem, that he destroyed in 70AD, and that the Visigothic king, Alaric I, took from Rome in 410AD. (Details of the treasure are in the Bible in Exodus, chapters 25, 26 and 27.) The Jerusalem Treasure came to France with King Ataulf who married Galla Placidia at Narbonne; his successor Wallia took the treasure to Toulouse. The treasure remained at Toulouse until threatened by Clovis, but when he arrived at Toulouse he did not find any treasure - it had been moved to Carcassonne, still owned by the Visigoths, and impregnable. Alaric II died in battle with Clovis, but not at Poitiers - that's another story! Carcassonne was a little close to the frontier (today's Lastours on the Montagne Noire) so when the Royal family retired to Rhedae - the new king was only five years old - the treasure went there too. Then the trail went cold . . . until now. The Book, called "L'Or de Rennes" has been published, but no bookshops yet have a copy. Apparently information in the Poussin paintings gave the writers their clues, and they say the treasure was known to have been guarded by the Templars. Franck Daffos tells a tale of the existence of a great room which "closed up" the war booty of the Visigoths behind "walls built by the Templars." "According to various writings, to penetrate this mythic place one must take away the bodies of thirty men, their throats cut by swords, who died to save the secret of this fabulous treasure." Pure speculation, said the newspaper. Local, national and international papers published the story and various aspects of it. All the Rennes-le-Chateau people, on Facebook and on their web-sites, talked about nothing else for a week. The cave however, is not really close to Rennes-le-Chateau, but 13 kilometres as the crow flies, and about 20km by road. It is on a mountain called Pech d'en Couty, 2km east of Sougraine, to the right of the road that goes up to the Source Salée. The owner of the mountainside, Dieudonne Rousette, was naturally worried about hoards of treasure-seekers trampling over his land. But a visit from Captain Baudry of the Gendarmarie at Limoux, put his mind at rest. Asked if he believed the treasure was there, Dieudonee Rousset replied; "I am sceptic, but on the other hand, my wife Paquita, she believes it. She has read everything ever published about Rennes-le-Chateau. She's convinced the Visigothic treasure is buried on our domain." A local walker and treasure-hunter passing by, said; "Since 1969, I've come to the region every summer. I thought I would make a fortune by finding the tomb of an Egyptian goddess but I've given up now." This amused me, because my friend Suzette, who used to work as a schoolteacher in Rennes-les-Bains, told me; "Nowadays everyone is reincarnated from Mary Magdalene, but in my time here, the 1970's, everyone was reincarnated from Cleopatra!" I told Suzette about this latest treasure story and she thinks it is possible, whatever the treasure is, that the Templars guarded it. She knows their history well, as she lives in Douzens, where there was a commandery. I asked around in Rennes-le-Chateau and was told; "It might not be the treasure of Jerusalem, but there's certainly something there, we and the police are all taking it seriously, it could be, for example, a Visigothic tomb." Suddenly, everyone is interested in the Visigoths. "We're expecting," the local paper said, "A new wave - Visigothique!" Well, I do hope so. I would point out that I have written the only detailed book in English about the history of the Visigoths here in Languedoc. PS. I passed very close to the Pech d'en County when walking up to the "Salty Source" of the River Sals. See my article about Sougraine by clicking here. Everything was very quiet and there was no sign of the local gendarmerie guarding the cave. The film is in French but one sees the cave . . . the caver said the fissure was too narrow for him to go down. In fact, nobody has. The book was full of secret coded instructions to it, then speculated that a fall of rock had blocked the entrance.